In this research we have developed a treatment method for textile wastewater by TiO2/SiO2-based magnetic nanocomposite. Textile wastewater includes a large variety of dyes and chemicals and needs treatments. This manuscript presents a facile method for removing dyes from the textile wastewater by using TiO2/SiO2-based nanocomposite (Fe3O4@SiO2/TiO2) under UV irradiation. This magnetic nanocomposite, as photocatalytically active composite, is synthesized via solution method in mild conditions. A large range of cationic, anionic and neutral dyes including: methyl orange, methylene blue, neutral red, bromocresol green and methyl red are used for treatment investigations. Neutral red and bromocresol green have good results in reusing treatment. The high surface area of nanocomposites improve the kinetic of wastewater treatment. In this method, by using the magnetic properties of Fe3O4 nanoparticles, TiO2-based photocatalyst could be separated and reused for 3 times. The efficiency of this method is respectively 100% and 65% for low concentration (10 ppm) and high concentration (50 ppm) of neutral red and bromocrosol green after 3 h treatment. The efficiency of treatment using the second used nanocomposite was 90% for 10 ppm of the same dyes. 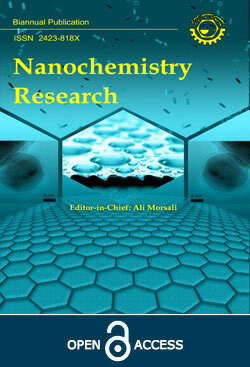 The foremost application of nanomaterials is in wastewater and air treatment. Recent growing ecological problems related to air and water pollutions have increased necessitate to new methods for pollution removing . For purification of wastewater, several methods such as reverse osmosis , photocatalytic , ultrafiltration, photo-Fenton , oxidation, ozonation [5,6], biological [7,8] and electrochemical methods  were developed. Among of these protocols, treatment based on nanoparticles offer excellent prospects for chemical and biological sensing . The estimated total wastewater discharge from textile plants engaged in wet-finishing is noticeable and needs to be treated through economical cost-effective methods . Biological treatment reduces soluble organics and other contaminants in wastewater which are not removed in primary treatment . The progress of treatment processes is followed by various nanostructures of titan dioxide. TiO2 photocatalyst has attracted much attention for the last decade because of its high efficiency [13-16] and also several advantages including inexpensivity, chemically stability, non-toxicity, photogenerating holes and electrons [17,18]. Based on these properties, TiO2 has a wide application in the degradation of pollutants in wastewater, photovoltaic cells, catalysis, photocatalysis, separation, sensors, optical devices and selective absorption [19-21]. The band gap of TiO2 is slightly more than 3.0 eV which means a very small part in the solar radiation could be suitable for the excitation of electrons from the valence band to the conduction band (the ultraviolet part only) . TiO2 as the photocatalyst has recently attracted great interest for using solar radiation as a light source for water and wastewater treatment . On the other hand, magnetic photocatalyst containing a core of Fe3O4 and a shell of TiO2 has been developed to avoid photodissolution of iron and to prevent Fe3O4 from acting as an electron hole recombination center. And using a SiO2 layer between Fe3O4 and TiO2 improves the photocatalytic properties of the composites . Photocatalytic treatment with TiO2 is an emerging wastewater treatment technology with key advantages counting on the lack of mass transfer limitations, operation at ambient conditions and the feasible use of solar irradiation. Photolysis and photocatalytic treatments were carried out over a suspension of titanium dioxide or zinc oxide under artificial irradiation . Yu et al. used TiO2 nanoparticles for selective photocatalytic degradation anionic dyes . Krusic's research group developed a method using TiO2/hydrogel nanocomposite for treatment of some textile azo dyes . Lucas et al. used Fe3O4@SiO2@TiO2 photocatalyst in combination with UV irradiation for Reactive Blacks . TiO2 photocatalyst, in anatase phase, was used by Hu's group for decoloration of some dyes such as methylene blue, orange G and rhodamine B . Reyens-Gil's group developed WO3-enhanaced TiO2 nanotube photoanodes for organic and oxidized pollutants . Cyclodextrin- functionalized Fe3O4/TiO2 core-shell nanocrystal was used for photocatalytic endocrine-disrupting chemical in water by Vasudevan's group . In this study, we have synthesized and used TiO2/SiO2-based nanocomposite (Fe3O4@SiO2/TiO2) in presence of UV irradiation for removing some dyes from the textile wastewater. For this research, several cationic, anionic and natural dyes including methyl orange, methylene blue, neutral red, bromocresol green and methyl red were applied. Neutral red and bromocrosol green have good results in reuse treatment. By using magnetic particles, the TiO2 composite could be recovered and used three times for treatments. To the best of our knowledge, the simple synthesized Fe3O4@SiO2/TiO2 nanocomposite (Fe3O4@SiO2/TiO2-NC) is able to remove various dyes and UV-Vis spectroscopy as an easy and accessible method can be used for treatment monitoring. The synthesized Fe3O4@SiO2/TiO2 was characterized using FT-IR, UV-Vis and TEM instruments. Bromocresol green, methyl orange, methyl red, natural red, methylene blue, hydrochloric acid, iron(II) sulfate hepta-hydrate, iron(III) chloride hexa-hydrate, tetraethylammonium hydroxide (Et4NOH), tetraethoxysilane (TEOS) and sodium hydroxide were purchased from commercial sources (Merck, Fluka or Sigma) and used without further purification. The distilled-deionized water was used in all solution preparation (18 MΩ). The stock solutions of the dyes (50 ppm) were prepared freshly in distillated water. Preparation of the Fe3O4 nanoparticles. Hydrophilic magnetic-nanoparticles were prepared according to Sun’s method . Briefly, 3 ml of iron(II) sulfate solution (2 M) and 10 ml of an iron(III) chloride solution (1 M) were mixed under vigorous mechanical stirring at room temperature and 15 ml of HCl solution (2 M) was used to dissolve the iron salts. An aliquot of 50 ml of tetraethylammonium hydroxide (Et4NOH) was added to the above solution until the solution reached a pH of 13. Immediately a black solution was formed. Figure 1 shows the TEM image of Fe3O4 nanoparticles. Based on TEM image, the ultrafine particle diameter size of the synthesized Fe3O4 is about 15-25 nm. Preparation of TiO2 coated Fe3O4. An inertial layer (SiO2) between TiO2 coating and magnetic material was proposed for better coating of TiO2 layer and to avoid photodissolution of iron. 50 mg of magnetite-nanoparticles was dispersed in 20 ml of deionized water containing (TEOS) under sonication for 20 min . The aggregated magnetic particles were separated and the suspension was transferred to another beaker. The separated Fe3O4@SiO2 nanoparticles were washed with water and ethanol. For TiO2 coating purpose Fe3O4@SiO2 nanoparticles were dispersed in TiCl4 solution [50 ml ethanol containing 2 ml of TEOS] solution for 30 min under sonication and relaxed for 2 h. After 4 steps washing with ethanol and distillated water, the Fe3O4@SiO2/TiO2 composite was dried and stored . The synthesized nanocomposite was characterized using FT-IR and UV-Vis (Figs. 2a and 2b). The background corrected FT-IR spectra of MNPs are shown in Fig. 2a. The broad band around 3400 cm-1 can be assigned to O-H stretching vibration which is assigned to the surface OH groups of Fe3O4 NPs. The absorption bands around 580-610cm-1 is attributed to the vibration of Fe-O bond in Fe3O4. In the FT-IR spectrum of Fe3O4@SiO2 and Fe3O4@SiO2/TiO2-NC (Figs. 2a and 2b),the band at about 1100 cm-1 is assigned to stretch of Si-O bond and the SiO-H/TiO-H groups are appeared by the very broad IR absorption band in the 2800-3700 cm-1 region. In the Fig. 2c, the ratio of 580-610 cm-1 to the 1100 cm-1 show that the coating of TiO2 is not core-shell nanoparticle. The structure was synthesized as nanocomposite format (Fe3O4@SiO2/TiO2). For refinement process the Fe3O4@SiO2/TiO2 composite was added to wastewater and mixed by shaker for an appropriate minutes (Table 1), inside of UV irradiation chamber (254 nm) and then test tube was removed from UV chamber and nanocomposite was removed by external magnetic field. Some parameters such as mixing time, amount of Fe3O4@SiO2/TiO2, pH and mixing method were optimized. Figure 3 shows the steps of wastewater treatment with Fe3O4@SiO2/TiO2. Fig. 1.TEM image of Fe3O4 magnetic nanoparticle. Fig. 2. (a) FT-IR and (b) UV-Vis spectra of a:Fe3O4 nanoparticles, b: SiO2 modified Fe3O4 nanoparticles and c: TiO2 modified particle. TiO2 photocatalysis is an emerging wastewater treatment technology with key advantages including the lack of mass transfer limitations. Immobilizing TiO2 on Fe3O4 magnetic nanoparticles is a good strategy enabling the scientists to recover the photocatalysis for several treatment processes . This type of nanoparticle in aqueous solution under UV irradiation is better than that of Fe3O4@TiO2 because insulation SiO2 layer prevents photodissolution of Iron. Fe3O4@SiO2/TiO2-NCcould be easily separated from wastewater by applying a magnetic field. In this research for achieving a good performance in treatment process several parameters were optimized as will be mentioned in below such as UV irradiation, pH, amount of Fe3O4@SiO2/TiO2-NCand treatment time. Fig. 3. Steps of the proposed wastewater treatment. When solution of dye, neutral red or bromocresol green, was exposed to light in presence of TiO2; initially, the dye molecules, present in singlet ground state, absorb the radiation of suitable wavelength, and are excited to their first excited singlet state. These excited singlet molecules are converted to the triplet excited state . When TiO2 absorbs a photon with equal or greater energy than its band gap width, an electron may be promoted from the valence band to the conduction band leaving behind a hole in the valence band. The electron and hole may migrate to the catalyst surface where they participate in redox reactions with absorbed species. The electron, released from TiO2, will reduce the dye molecule to its colour less products . (Eq. (1)). For determination the effect of UV irradiation on the degradation process two solutions containing 8 ml of 10 ppm of determined dye and 2 mg of Fe3O4@SiO2/TiO2-NCin different conditions were compared, with and without UV irradiation condition. The Fig. 4 shows the UV-Vis spectrum of these samples. The UV irradiation in λmax (254 nm for) improved the treatment up to 65% (decrease percentage of dye absorption) and without UV irradiation no significant treatment was observed. pH is an important factor for the interaction of target compounds with mineral oxide surface due to the charge density of nanoparticle which varies strongly with pH value. Therefore pH is very important in wastewater treatment process with nanomaterial. Also pH changes can influence the adsorption of dye molecules onto the TiO2 surfaces, a key step for the photocatalytic oxidation. To obtain a stable colloidal solution of Fe3O4@SiO2/TiO2 a confident amount of acid (HCl) is crucial and this is necessary to preserve the particles in nano-sized structure. The effect of pH on the degradation was determined by using different pH including 2, 3, 4 and 8. In basic condition especially pH 8, there is not any effect and degradation. In acidic condition a good performance for Fe3O4@SiO2/TiO2 was observed. The efficiency of treatment process in different pH values is shown in Fig.4. UV-Vis absorption peak at λmax 543 nm for acidic pH was revealed. The pH 3.7 was selected as optimum pH for wastewater treatment process (Fig. 5a). The amount of Fe3O4@SiO2/TiO2-NC can affect the kinetic of the treatment processing. For various amounts of Fe3O4@SiO2/TiO2-NC,the intensity of UV-Vis absorption peak (at wavelength of 543 nm) was monitored for 10 ppm textile color solution (Fig. 5b). In next experiments 2 mg of Fe3O4@SiO2/TiO2-NC, as optimum value, and 8 ml of sample were used for time optimization. Fig. 4. The effect of treatment efficiency of neutral red solution (5 ppm) after 3 h in different conditions, (a) without UV irradiation, (b) with UV and (c) with UV and Fe3O4@SiO2/TiO2 for neutral red. Fig. 5. The effect of different (a) pH values and (b) amounts of Fe3O4@SiO2/TiO2 on treatment efficiency. For determination the kinetic of treatment process with Fe3O4@SiO2/TiO2-NCin presence of UV irradiation, different times were checked. For treated wastewater after 3 h, a significant decrease in UV-Vis absorption intensity was observed. UV-Vis absorption intensity of wastewater after different times is shown in Fig. 6. The optimum time was used for next experiments. Different concentrations of dyes were used for investigation of treatment efficiency. In Fig. 7 the efficiency of treatment on bromocrosol green is shown. The UV-Vis absorbance of different concentrations of bromocrosol green before and after treatment is shown in Fig. 7. For 2 mg of Fe3O4@SiO2/TiO2-NC, 10 ppm and lower concentration showed excellent efficiency. Fig. 6. Time optimization for treatment processing (a) UV- Vis absorbance of treated solution, (b) the difference of UV-Vis absorbance between non-treated solution and treated solution for different times. Fig. 7. UV-Vis absorbance of wastewater (left) before treatment and (right) after treatment for different concentrations of Bromocresol green. Fig. 8. Efficiency of the wastewater treatment for real sample spiked with BCG and bromocrosol green (UV-Vis absorbance a: before and b: after Treatment). In this research, efficiency of wastewater treatment for different dyes was determined. Several dyes were used for treatment investigation including methyl orange, ethylene blue, neutral red, bromocrosol green and methyl red. Neutral red and bromocrosol green have shown good results in reusing. In Table 1, Comparison of the proposed methods with other reported techniques is shown. The UV-Vis absorbance of these dyes before and after treatment with Fe3O4@SiO2/TiO2-NC and UV irradiation are shown in Fig. 8. Fe3O4@SiO2/TiO2-NChas shown a good efficiency for thetreatment of textile wastewater. The efficiency of this method for neutral red and bromocrosol green is 100% and 65% for low concentration (about 10 ppm) and for high concentration (50 ppm), respectively. Main advantages of this treatment are simplicity and cost-effectiveness. By recovery of used Fe3O4@SiO2/TiO2 and could be at least 3 times. The efficiency of treatment by using the second used nanoparticle was 90% and 50% at low and high concentrations, respectively. These results show that the complete treatment at high concentration needs to more amount of nanocomposite. Using Fe3O4@SiO2/TiO2-NC nanocomposite in aqueous solution under UV irradiation is better than Fe3O4@TiO2because insulation SiO2 layer prevents photodissolution of iron. Efficiency of wastewater treatment for real sample spiked with neutral red and bromocresol green was determined. UV-Vis absorbance of the real wastewater before (curve a) and after treatment (curve b) are shown in Fig. 8. The authors would like gratefully acknowledge the financial support of this project by research council of University of Isfahan. M. Lucic, N. Milosavljevic, M. Radetic, Z. Saponjic, M. Rodoicic, M.K. Krusic, 122 (2014) 206. L.A. Ioannou, C. Michael, N. Vakondios, K. Drosou, N.P. Xekoukoulotakis, E. Diamadopoulos, D. Fatta-Kassinos, Sep. Purif. Technol. 118 (2013) 659. A.J. Attia, S.H. Kadhim, F.H. Hussein, Eur. J. Chem. 5 (2008) 219. K. Barbusiński, Pol. J. Environ. Stud. 14 (2005) 281. M.J. Farre, M.I. Franch, S. Malato, J.A. Ayllon, J. Peral, X. Domenech, Chemosphere 58 (2005) 1127. H.N. Liu, G.T. Li, J.H. Qu, H.J. Li, J. Hazard. Mater. 144 (2007) 180. Y.H. Lee, R.D. Matthews, S.G. Pavlostathis, Environ. Res. 78 (2006) 156. S.P. Buthelezi, A.O. Olaniran, B. Pillay, Molecules 17 (2012) 14260. D. Dagon, H. Turkdemir, Pol. J. Environ. Stud. 21 (2012) 1185. V.B. Upadhye, S.S. Joshi, 3 (2012) 264. Y. Jin, L.Y.L. Yong-kang, L. Jun-ping, Chem. Res. Chinese U. 26 (2010) 278. J. Perkowski, L. Kos, Fibres Text. East. Eur. 11 (2003) 85. M. Melemeni, S.D. Stamatakis, N.P. Xekoukoulotakis, Global NEST J. 11 (2009) 357. W. Zhang, L. Zou, L. Wang, Appl. Catal. A-Gen. 371 (2009) 1. N.A. Kouamé, D. Robert, V. Keller, N. Keller, C. Pham, P. Nguyen, Environ. Sci. Pollut. R. 19 (2012) 3727. D. Mahne, U.L. Stangar, P. Trebse, T.G. Bulc, Int. J. Photoenergy 2012 (2012) 1. M.S. Lucasa, P.B. Tavaresa, J.A. Peresa, J.L. Fariab, M, Rochac, C. Pereirac, Catal. Today 209 (2013) 116. P.M. Álvareza, J. Jaramilloa, F. López-Pi˜neroa, P.K. Plucinskib, Appl. Catal. B-Environ. 100 (2010) 338. B. Oregan, M. Gr¨atzel, A Low-cost, Nature 353 (1991) 737. R. Asahi, T. Morikawa, T. Ohwaki, K. Aoki, Y. Taga, Science 293 (2001) 269. X. Chen, S.S. Mao, Chem. Rev. 107 (2007) 2891. F.H. Hussein, T.A. Abass, Int. J. Chem. Sci. 8 (2010) 1353. Y. Li, W. Zhang, X. Li, Y. Yu, J. Phys. Chem. Solids 75 (2014) 86. Y. Hsiao, T. Wu, Y. Wang, C. Hu, C. Huang, Appl. Catal. B-Environ. 148-149 (2014) 250. K.R. Reyes-Gil, D.B. Robinson, ACS Appl. Mater. Interfaces 5 (2013) 12400. R. Chalasani, S. Vasudevan, ACS Nano 7 (2013) 4093. J. Sun, S. Zhou, P. Hou, Y. Yang, J. Weng, X. Li, M. Li, J. Biomed. Mater. Res. A 80 (2006) 333. J.P. Cheng, R. Ma, M. Li, J.S. Wu, F. Liu, X.B. Zhang, Chem. Eng. J. 210 (2012) 80. O. Sharma, M.K. Sharma, Int. J. Chem. Tech. Res. 5 (2013) 1615.